Chinese coolies from Swatow disembark at Belawan. 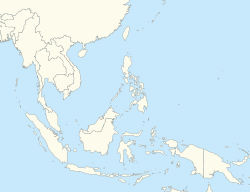 Belawan (Chinese: 勿老灣; Pe̍h-ōe-jī: mài lau ôan) is a harbor in Medan, Indonesia. Located on the northeast coast of Sumatra, Belawan is Indonesia's busiest seaport outside of Java. A regular ferry service connects Belawan to across the Strait of Malacca to Penang, Malaysia; at times there was a ferry that also ran from Belawan to Phuket, Thailand and to Langkawi, Malaysia. The port was initially built in 1890, to provide a location where tobacco could be transferred directly between rail lines from the interior and deep-draft ships. The harbor expanded in 1907 with the construction of a new section intended for Chinese and indigenous traders, reserving the existing port for European shipping. In the early twentieth century the port's business expanded, with the growth of major rubber and palm oil plantations in northern Sumatra. In the 1920s several major berthing facilities were built. In 1938, the port was the largest port in the Dutch East Indies, in terms of cargo value. Cargo volumes dropped substantially after Indonesian independence, and did not reach pre-independence levels again until the mid-1960s. A major restructuring in 1985 saw the construction of a container terminal; it almost immediately captured about one-fifth of Indonesia's containerized exports. Major products exported include rubber, palm oil, tea, and coffee. In early 2013, Belawan Port can serves 1.2 million twenty-foot equivalent units (TEUs) per year and now is still gradually expands to 2 million TEUs with Rp.975 billion ($89.7 million) fund. ^ "Pelindo I menggarap proyek Belawan dan Batu Ampar". Retrieved April 23, 2013. Airriess, Christopher A (1991). Global economy and port morphology in Belawan, Indonesia. Geographical Review 81(2):183-196. This page was last edited on 14 March 2019, at 15:35 (UTC).